Elizabeth is a self-taught artist and has been painting for many years. She embraces the freedom paint allows her to have, by using a variety of techniques and materials, immersing herself in a world of colour. Elizabeth works in many different mediums and has two very distinctive styles, one she calls her “Country Life” where she works in watercolour producing whimsical loose style paintings of animals, birds and some figurative pieces. The other she calls her “City Life” where she produces large, abstract and striking pieces. More recently delving into her Far Eastern roots she has been working on a collection of Japanese Red Crowned Cranes, Geisha & Koi. She loves the challenge of working with new mediums and experimenting with new effects in painting. 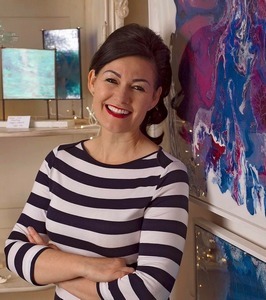 Elizabeth’s paintings are created using an exciting range of media including pouring and dripping using fluid acrylics, metallic lustre paints and gold leaf, often embellishing with glitter, nail polish, sequins and crystals in very intricate detail. Her use of different media and her love of colour has continuously developed and evolved together with her use of resin. Elizabeth enjoys the gestural abstract approaches of painting while allowing incidents and effects take place in her compositions. She wants to take you on a journey with her work with the infusion of beauty, colour, harmony and intrigue, she hopes you will find that original piece that will meet your artistic sensibilities. As good as photography is these days, Elizabeth’s paintings need to be seen in the flesh in order to be truly appreciated. If you would like to own an orignal, commissioning a piece of art is easy and an exciting process, whether you are looking for a piece to complement a room or give as a one of a kind gift, either way you are having something created that is just for you. A painting is something that can be treasured forever and may even gain in value, so being the proud owner of an original piece of art is also a great long term investment. I am very happy to visit you to talk about your requirements, this could be the type of art you require, subject, colours, size and the placement of the commissioned piece. To start the process of owning your very own unique piece of art, please contact me here to start the discussions via message or phone.